I’ve been mentally writing this post the whole summer. 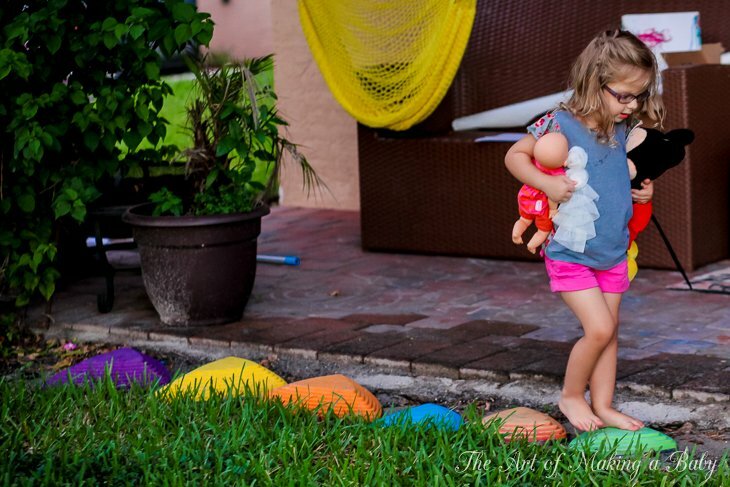 Every time I would go outside with Lexi, I would think about mentioning this and that in a post on the blog. So I’ll keep it short but to the point. 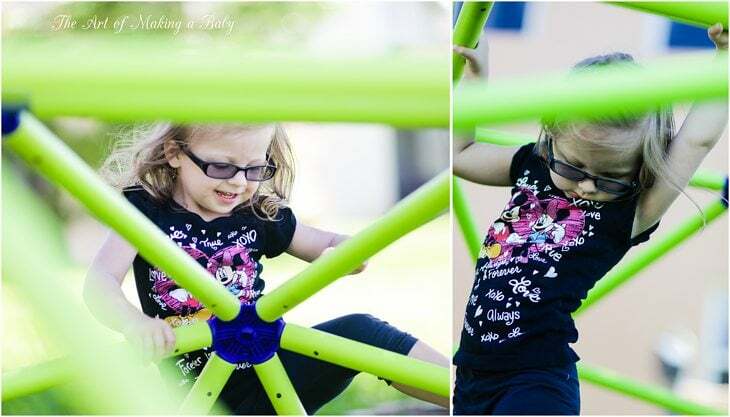 After getting glasses, we decided to start spending even more time outdoors because that was the only thing that seemed to have any kind of correlation to slowing down myopia in studies . So we figured why not focus on spending as much time as possible outdoors. That meant creating an environment that was stimulating and interesting enough, especially for Lexi since she has a pretty high threshold on stimulation, just like her mama. 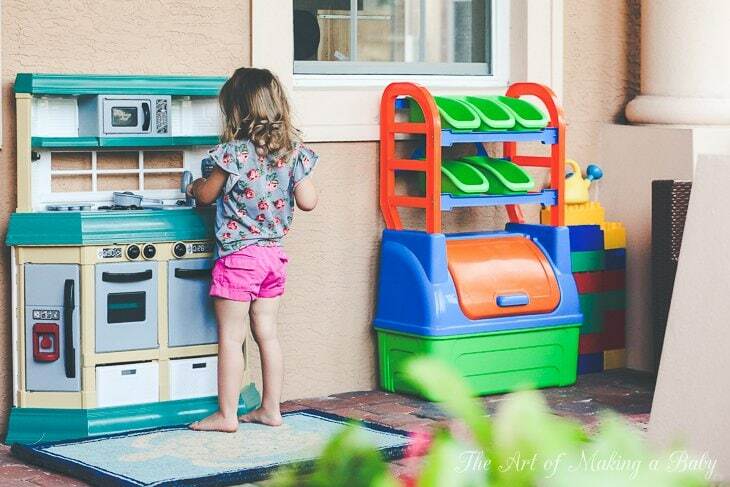 I had a few items we loved before that we moved outside and then slowly “collected” other toys that have together created her “outdoor space”. Am I missing anything? 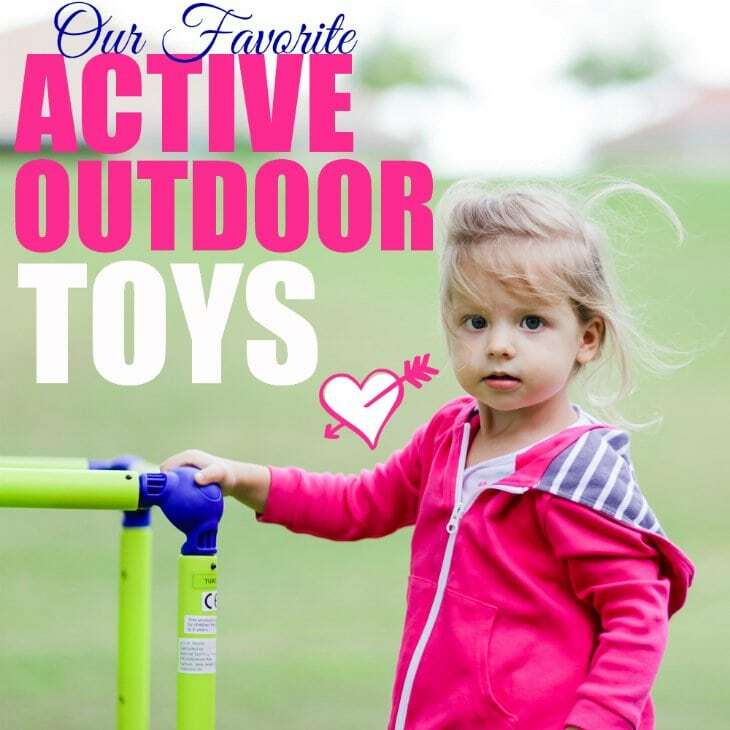 What are some of your favorite outdoor active toys for kids? I almost didn’t write about it, but then at the last second thought “Why not?” It’s a great product, it makes a billion bubbles per second (best of all machines we’ve tried), Lexi begs for it daily, which usually means we go through the solution faster than we can stock up on it, but that’s a great testament to how much fun the machine is. 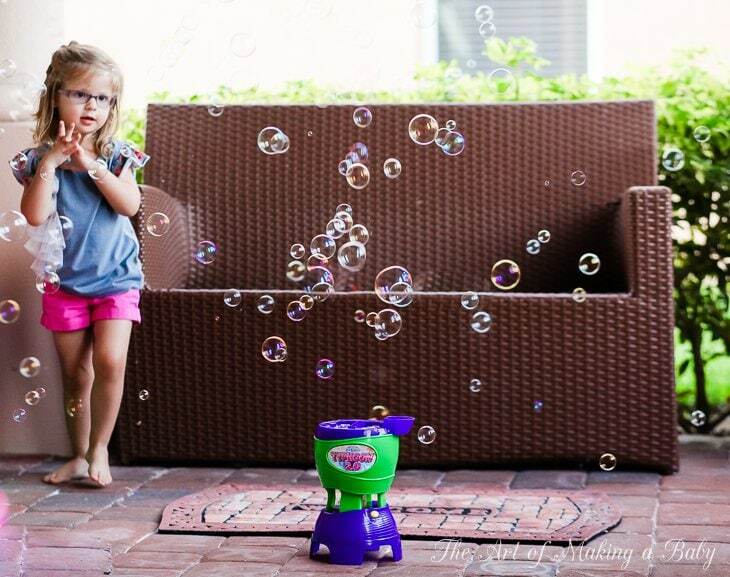 And technically, it IS an active toy, since half the time she is chasing and popping bubbles and the other half, she is dancing around crazily from excitement. Unfortunately, we are yet to install it, because it requires leveling our yard and that’s an issue onto itself. But once we have the patio extended and the yard leveled, Andrew will be putting this puppy together. Very excited about it. This one is pretty cool too. 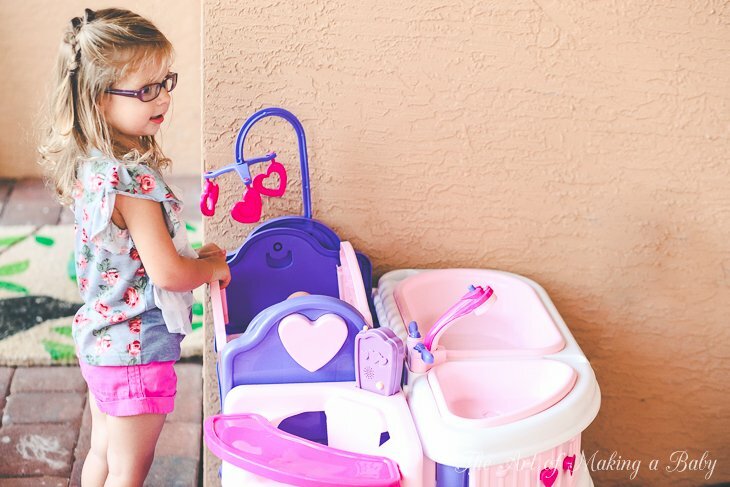 Previously to this townhouse, I’ve been looking at different playhouses trying to determine one with the features that would most interest Lexi’s personality. The Towncenter comes pretty close to being a perfect 10. 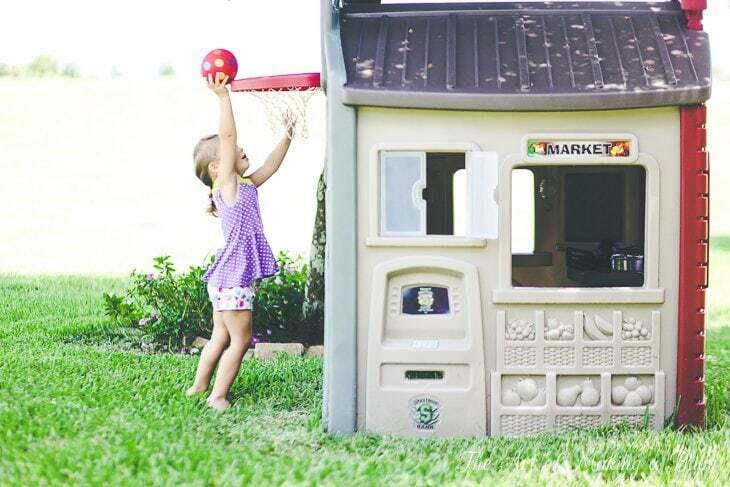 It has a gas station with a pump, a door to open/close (Lexi is very action oriented, so this is important), windows that open close, a basket hoop and a soccer net (not too interested in that yet), it has a chalkboard and a phone. I even let her color the fruits and veggies in the “market” which she LOOOVES doing! I was going back and forth on this item, because it is made of softened PVC, but I was already easing up on these kinds of things since Lexi is not a vulnerable little baby any more and she doesn’t take things in her mouth much and I was already writing a feature on it for Daily Mom as it is, so I figured we’d try it. Ummm, let me tell you, friends, this is by the far the best freaking thing that has happened to Lexi this summer. Seriously, the giggles that come out of this play center are worth all the PVC exposure in the world (luckily it’s phthalate-free). 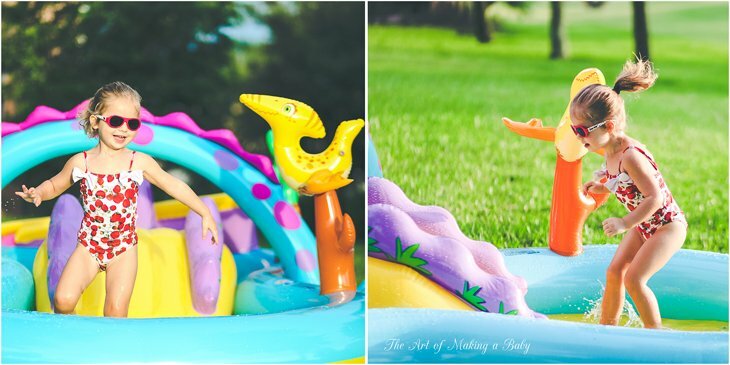 She jumps and slides and giggles and jumps more and crashes into it for hours. 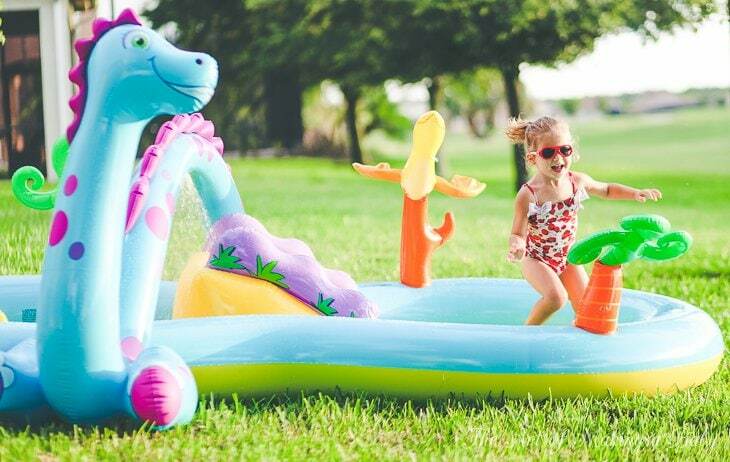 We also have a whole set of toys that we use for our outdoor playground from American Plastic Toys. 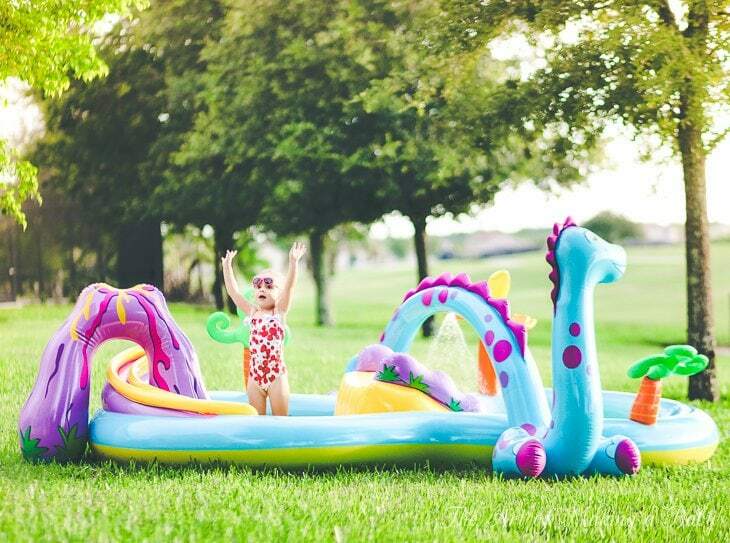 They are VERY inexpensive and are perfect for patios since you are not as worried about the items being ruined by weather due to it being made of plastic and its super affordable pricing. 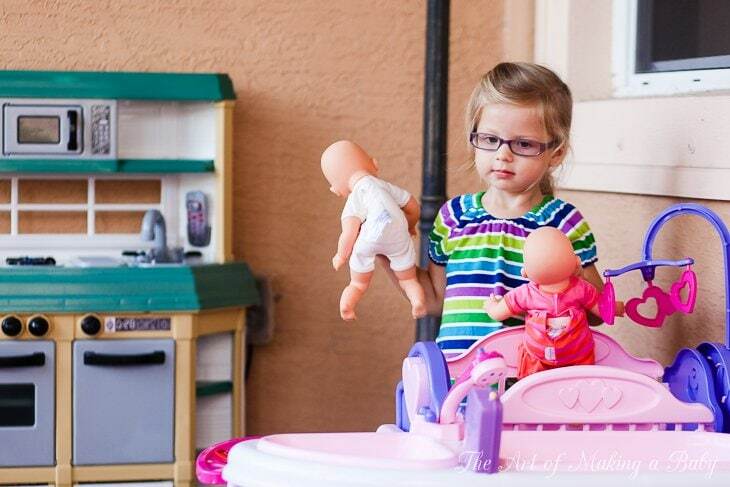 We have a Nursery for her dolls, a Kitchen , Art table, Water table and Toy storage. I am including the prices so that you could understand how incredible and more affordable their pricing structure is. I will be posting about their whole line on Daily Mom, so look forward to that. I’m also linking to the colors that I was able to find quickly. The items all have traditionally boy colors as well. 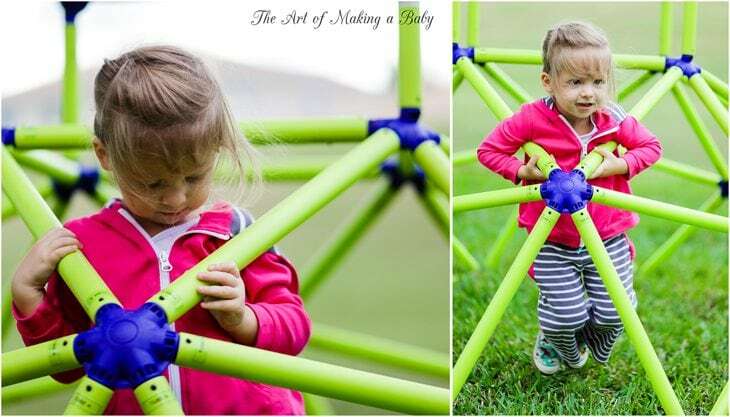 This is a great climbing structure for active kids. 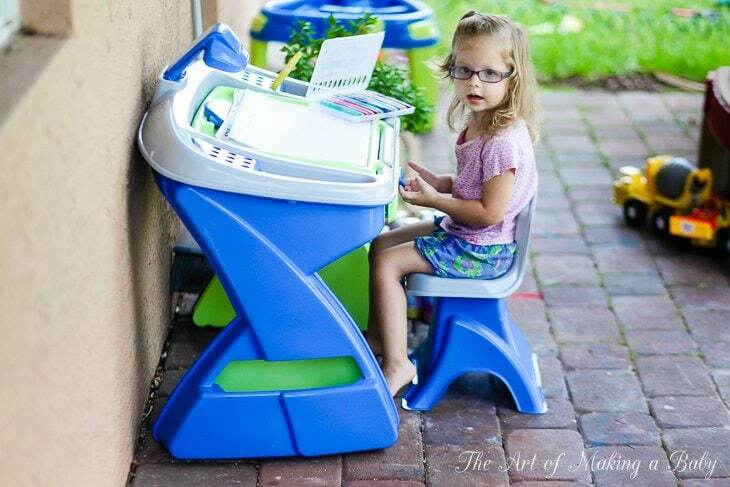 Easy to assemble and very sturdy, it is a lot of fun. 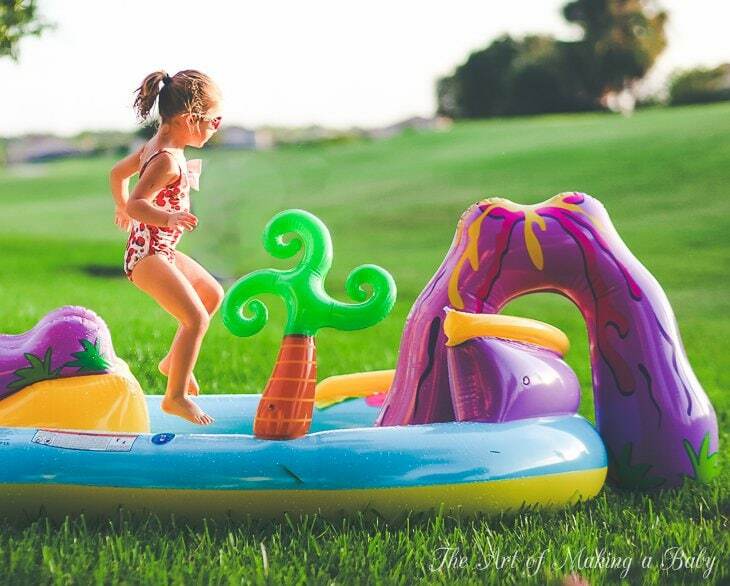 I have a ton of pictures of Lexi playing on it, so we’ll go into photo overload here in a bit. 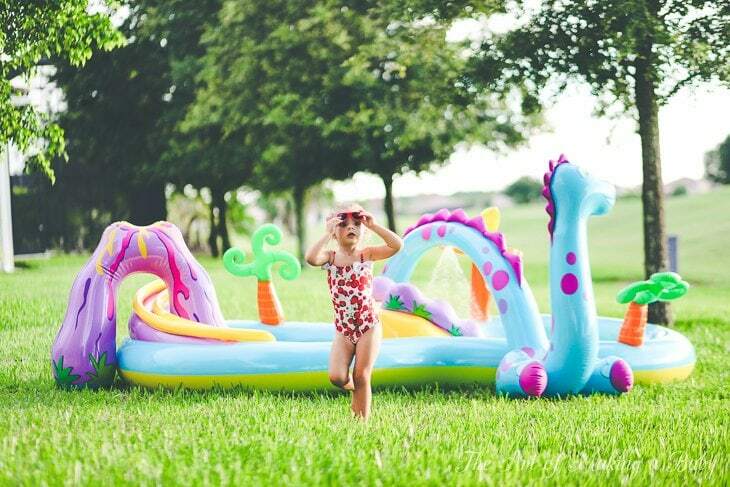 At first I was leery of the fact that it was made with PVC ( this was month before the pool). I asked the company to send me test results and they were perfect, so I thought that considering it’s going to be outside and it’s not the type of PVC that has phthalates, I would go for it. 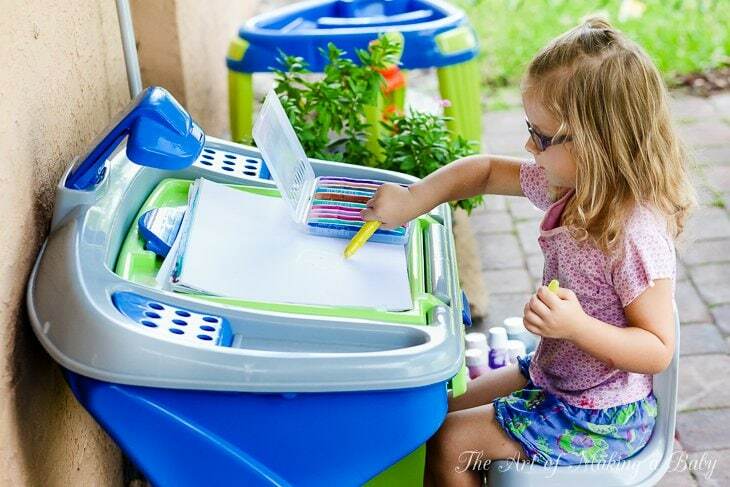 Super fun activity, especially for households with two kids. Lexi has become progressively better at climbing it and swinging down like a money and flipping over. She started doing this at just over 2 and was pretty good to begin with, despite the fact that she wasn’t a fan of climbing at the time. I say any active kid must have a climbing structure like this. This simple curvy foam beam has served us well since Christmas. 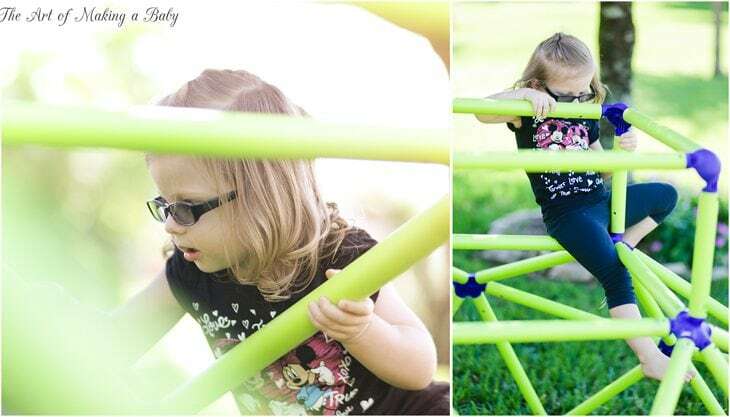 It assembles easily (can be done by a toddler) and Lexi loves practicing her beam walking. We often use it indoors but it’s a great item to bring outdoors as well. Again mentioned them at Christmas, as this was one of her Christmas gifts, she loves them and as she grows at each stage she finds more to do on these stones. Before she would walk, now she jumps from stone to stone. As she grows older I am sure she will find many ways to incorporate them into her play. 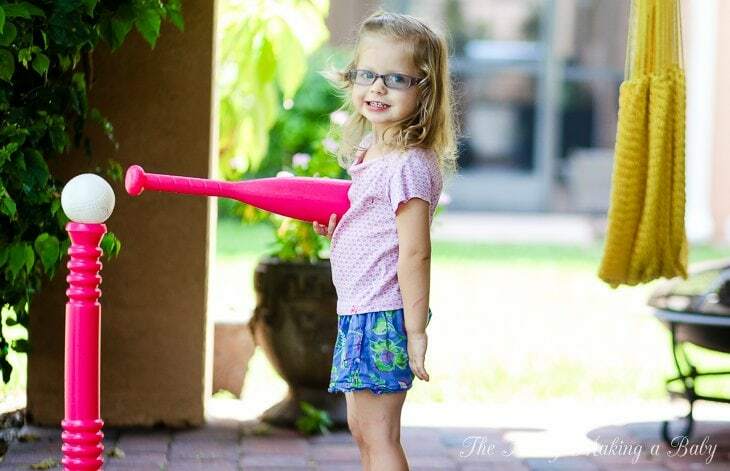 She loves the idea of baseball, so she often has us bring out our mitts and her little mitt and play baseball. So I bought the T-ball set and she definitely plays with it at least once daily. We do family scootering. Two adult scooters from Micro Scooters and one pink scooter for Lexi from Ybike. Together it potentially creates a lot of fun. 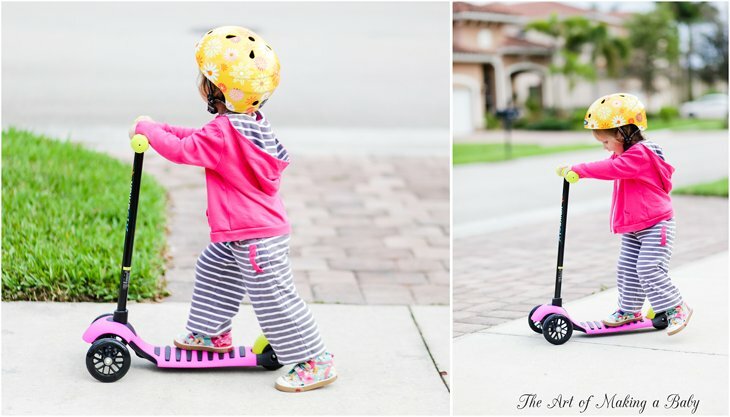 Potentially, because Lexi won’t go scootering for long distances. She isn’t old enough and she really doesn’t love not having her balance. She rides it around the driveway and we can sometimes get her to go a few houses down. However, I am very excited to see it improve with age and have scooter rides around the neighborhood every evening. Our starter trike is by Morgan Cycle and it’s a BEAST! It’s made of steel, heavy and looks and feels like it can withstand a legit car crusher. But it rides smoothly and looks like something Barbie would ride. And so I love it, and Lexi does too. Again no long distance biking, but it’s a trike, a introduction to the world of cycling. But it’s truly a beautiful and beautifully made product! FYI, re: running out of bubble solution–you can make your own super easily, by just watering down liquid dish soap (like Dawn). There are more involved “recipes” online, too, but plain old dish soap and water work just fine. Use trial and error to find the water/soap ratio that works best with your particular brand of soap. I’ve heard baby shampoo works, too, but we just use dish soap. Hahaha! Sorry that was an oversight! It was supposed to automatically uncheck comments, but sometimes it doesn’t and I forget to check. 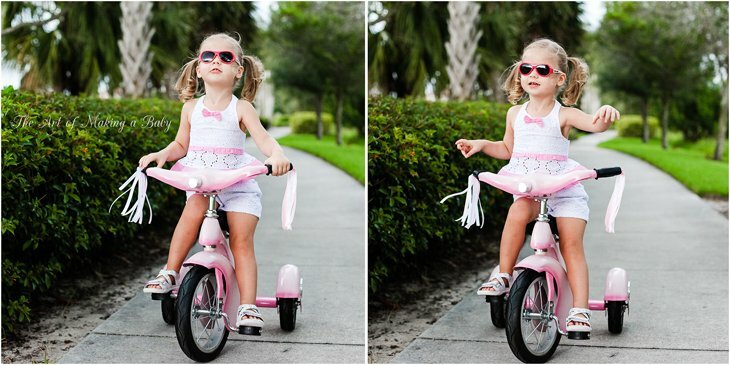 How is she doing with her balance bike? Um not great. I see kids using these everywhere but as soon as she feels a bit off balance on it she puts it aside. we are currently at the stage where she is afraid of anything moving. Won’t get on on her bike, trike, power wheels, slightly better on scooter but won’t ride it long. Hoping it passes soon. 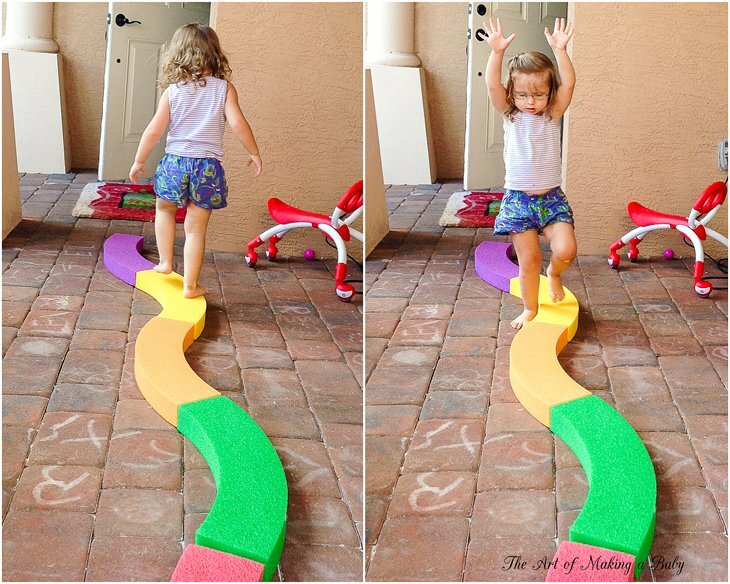 But right now she prefers movement with her body rather than using a toy. It’s peculiar.